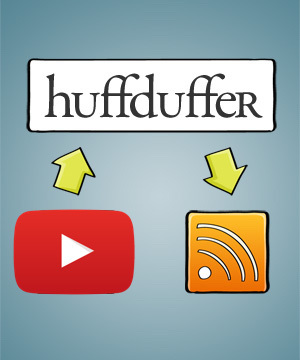 huffduff-video, my latest side project, lets you send Huffduffer the audio from videos on YouTube, Vimeo, and more. Just grab the bookmarklet, click it next time you find a video that you want to listen to, and it should show up in your podcast app automatically! It’s pretty bare bones, but it does the trick. Thanks to youtube-dl for all the heavy lifting, Jeremy Keith for building the wonderful Huffduffer, Bret Comnes for the inspiration, and interviewers and speakers everywhere for providing so many great videos to huffduff! @kevinmarks lack of official podcast feed a strategic choice? Thanks for tool tip thoug. Will be used! Hi! Who is paying for the storage? Is there a way to donate. Because I really really like this. Its what I was looking for for a long time. Also, would it be possible to always add the video link to the description? @Christian thanks for the kind words and the offer! don’t worry about donating; i’m going to make the mp3 files expire after a month or two, so storage should only cost me a few dollars a month. and yes, video link in the description is a great idea! will do. #IndieWeb I’ve always loved @huffduffer! @weegee asked a question that I’ve always struggled with. @schnarfed has already built the answer – naturally. I’m not sure why I’m surprised anymore, but it seems like every time I find some really useful bit of web technology, it’s coming out of the extended IndieWeb “Camp” (pun moderately intended). Thanks @adactio and @schnarfed for making my life easier and better. got some heartwarming fan mail for huffduff-video today! Sometimes we do not have the perception of when we create something revolutionary that can help people in many different ways, this is my case with huffduff-video, this service has helped me and much to improve my studies, I was able to improve my grades meaningfully listening to good videos YouTube and even my college when I go to work every day. So thanks for this project! I’m sure there are thousands of happy users of this great tool. so humbling and nice to hear. thank you!